Shaun Wane is hoping his Warriors players will get the chance to exorcise the demons of last year’s Wembley defeat this season. Wigan face Hull KR in the sixth round of the Challenge Cup on Sunday afternoon, with a place in the quarter-final at stake. And the 19-times winners of the competition go in this year as 9/2 favourites to extend their record-breaking run and make amends for last year’s 18-14 loss to Hull FC. “It’s a competition which us as a club have a huge affinity with,” said the coach who played for Wigan at Wembley in the 1988 win over Halifax. “It means everything to us and I’ll be honest with you, I’m still haunted about the journey home last year. “I remember walking off the field struggling not to cry, shaking Lee (Radford’s) hand and biting my lip. Wigan are expected to have few problems negotiating their way to the last eight, with Hull KR missing a clutch of first choice stars. But Wane says the Cup won’t be treated differently to his side’s Super League campaign. 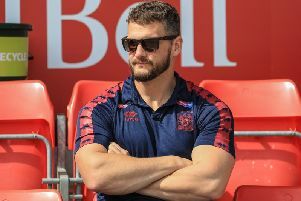 “If I’m honest, no, we see ourselves as winning all three trophies and that will be the goal for every Super League club I imagine,” he said. “We’ve got a long way to go before we get back there again but we’ve got a massive one this weekend.